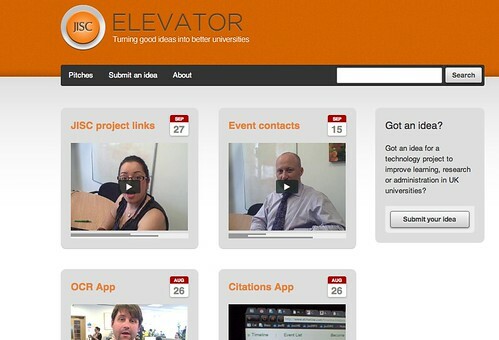 At the< JISC Innovation Forum today, a similar approach was pitched for attracting small amounts of JISC rapid innovation funding: the JISC Elevator (mock-up). One question that does come to mind is how this money might get spent? If you have an immediate development need, requiring 1-2 weeks of developer effort, for example, to prove some concept or other, and in return develop a working, if not necessarily production ready, service, where will that developer effort come from. Although I never really understand why, a few days work is the sort of work it can be really hard to schedule… So maybe we need slack capacity in the system, capacity that can work on short, itch scratching or blue skies doodles (not projects, doodles: always lightweight, small pieces lightly joined style applications or services), and pitch next step ideas around those doodles to elevator? 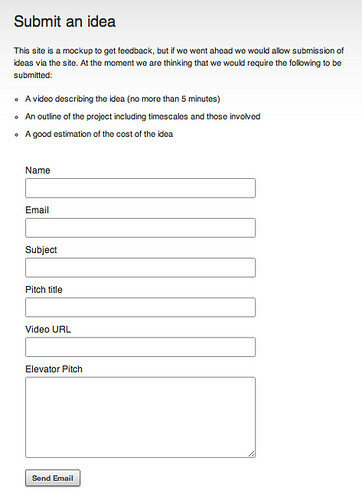 The Elevator idea is very much up for discussion, and very much in the spirit of the idea, capturing feedback on Uservoice… There’s also a poll to capture more immediate feedback – find it here: Is JISC Elevator a good idea? poll.